On October 2, 2014 from 4 a.m. to 8 a.m., the Galloway Township Police Department in cooperation with Administrator’s from The Greater Egg Harbor Regional School District would like to thank the faculty, students and parents for a successful safety inspection drill this morning at Absegami High School. The inspection was planned and carried out by School Officials and the Galloway Township Police Department with assistance from Atlantic City Police Dept., Hamilton Twp. Police Dept., Atlantic County Sherriff’s Dept., Cumberland County Sheriff’s Dept., Camden County Sherriff’s Dept., Gloucester County Sherriff’s Dept., Cape May County Sheriff’s Dept. and the New Jersey State Police K-9 units. Those respective agencies supplied eleven (11) K-9 Officers to inspect the entire building as well as all bags and school buses. The Atlantic City Police Dept. Bomb Squad was also on location. Last week, the police department was able to apprehend the person responsible for a credible threat made to the students and staff of Absegami High School. As a result of several recent threats we have decided to perform consistent safety inspections and random checks to include police presence and limited access to certain areas of the school. Please be advised that the Police Department and the Schools will not tolerate any criminal threats, mischief, inappropriate behavior or activities by anyone. We have and will criminally charge any offenders to the fullest extent allowable by law. Our mission is to keep your children and school faculty safe while protecting school property as well. The communities continued support in our school safety efforts is greatly appreciated. 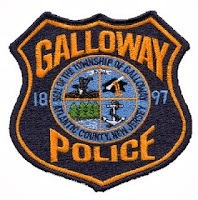 Anyone having information about illegal activity is asked to contact the Galloway Township Police Department at (609) 652-3705 or Atlantic County Crime Stoppers at (609) 652-1234 or 1-800-658-TIPS (8477).